If you are planning and organising a special event in the East London area, make sure that you give careful consideration to the catering that will be provided to your guests. As the food is often one of the most talked about elements from any event, you need to make sure you get it right! But no need to worry – with the services of Hog Roast East London at your disposal, you can rest assured that your event is in expert hands. There is no event too big or too small that cannot be catered for by the expert, professional team at Hog Roast East London. Summer weddings, evening BBQs, corporate business functions and family celebrations, we have it all covered and your guests can be treated to the wondrous sight of our professional chef cooking the hog roast in front of their very eyes. A hog roast is the perfect addition to any event and not only will your guests’ appetites be satisfied, but they will also be talking about your event long after they’ve returned home. 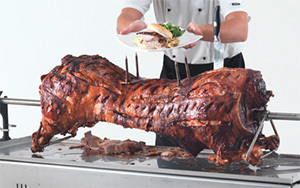 Our hog roast catering service is available to weddings of all sizes all over East London. Whether you have twenty guests or two hundred guests, our highly experienced team will ensure that each and every one of them is looked after. Your guests can enjoy the succulent and expertly cooked meat from our hog roast as well as a selection of complementary dishes and drinks. With prices as little as £250, a hog roast is a great way to impress your guests and provide them with a feast that is truly fit for a king and queen. Hiring a hog roast machine in the East London area couldn’t be easier. You can hire one of our easy to use hog roast machines along with a gas bottle and all of the necessities so that you can get started on creating a feast straight away. We deliver everything you need straight to your venue and can arrange collection afterwards – it couldn’t be simpler!